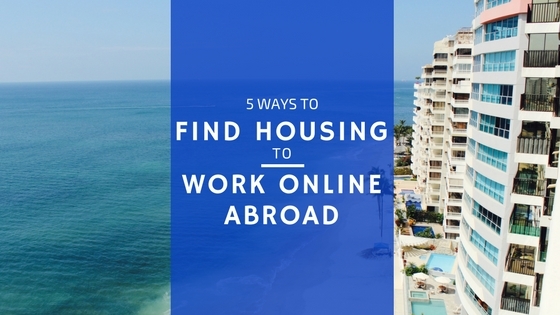 Thinking of moving to a new country to teach and work online abroad? This can be an excellent way to leverage earning money in one currency while spending in another, effectively increasing your spending power overnight. Those curtains didn’t last long. But how do you find a place to live abroad? It may seem like a daunting task, but by using the tips in this post and checking out our you’ll see it’s pretty easy! First, check out our Connected Classrooms Map to see if there is a verified location available where you’re going. I overstayed my welcome on friends’ couches, got too comfortable in my short-term rental and didn’t search around enough, and then I rushed to sign a 6-month lease through a Realtor when my visa was expiring in less than a month! 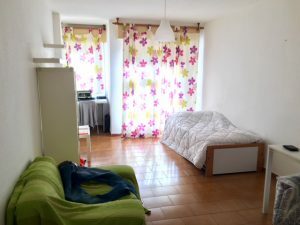 Almost every great search for anything begins on the good ol’ interweb, and housing abroad is no exception. You can get a general idea of the layout of the city, including proximity of certain neighborhoods to gyms, entertainment, dining, and historical attractions. You can also pick through the forums at places like nomadlist.com if you’d like to see where the prices match your budget and what other nomads have to say about their experiences. While this can be useful in weeding out locations that don’t suit your style, remember you can form your own opinion in a later step. As an additional part of the Online Researching step, check out local expat groups or apartment rental groups on Facebook or Couchsurfing (safely of course). But try this: Search for apartment rental groups in the language of the country you’re moving to. 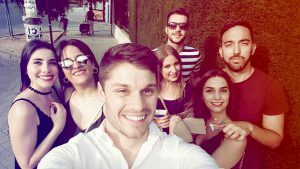 There are often separate groups for expats and groups for locals or university students, and I had much better luck finding affordable places in the groups my Spanish friends recommended than the ones targeting expats who don’t speak the language. If you don’t speak the local language, you can always ask a friend or go with google translate. Yea! Check out the next tip to see how social media will help you find friends you didn’t know you had. 2. Who do you know there? Are you on Facebook or other social media platforms? Have you met anyone in your travels who was originally from the place you’re going? Reach out to them. Getting perspectives from locals or friends who have visited the place are important because they’ll help you narrow your search and eliminate unsuitable neighborhoods before you even get there. They may even let you crash at their place until you’re settled! I reached out to some Spanish friends I had met in London who helped me narrow my search based on some criteria I gave them. When I arrived, I was ready to hit the ground running and knew just where to look. 3. Find a short-term rental and do some wandering. While your local contacts can be a huge help in finding your perfect apartment, you can’t leave all the searching to them, right? And there’s no better way to get a feel for a new city then to wander its streets on your own. If you’ve overstayed your welcome at your friends (gracias otra vez, amigos!) or no one has extra space for you at the time, stay in a hostel or rent a room through Airbnb for a week or so while you explore on your own. Owners often offer reduced weekly or monthly rates, so take advantage of them! Plus, here’s $40 off your stay with Airbnb as a first-time user to say thanks for reading! They walked around and took note of the ‘for rent’ signs along the way. This is where you might find a very inexpensive deal not listed elsewhere. 4. Call up a Realtor. I’ve left this as a last tip because it’s my least favorite and the least adventurous in my opinion, but it’s great in a pinch. It can also allow you to control your internet situation a bit better. Realtors are always there if you’re pressed for time, and although there may be commission fees if you end up going with the spot they showed you, you’ve saved time. Just make sure you’re aware of what you’re expected to pay and how long you’re signing on for. Have a local friend you trust read through the documents if you’re not given a copy in English and you’re unsure, or the lease might run beyond the date your visa expires depending on the country. You don’t want to spend your remaining time wherever you’re at scouring travel forums and panicking about getting fined or banned from most of the countries of an entire continent. These are two suggestions I haven’t tested myself as a teacher, but I know others who have used these platforms successfully. Housing and food are two of the biggest expenses when traveling, so imagine you could take care of some or all those costs. Couchsurfing.com lets you stay with locals for free. I buy them beer and make sure to clean up after myself but that’s about it. Housesitting or house-swapping allows you to watch someone’s house while their away. Just pay to become a member and the rest is often free. You’ll have use of their home for your teaching purposes. Workaway.info allows you to work in exchange for housing and often food. I worked at a villa in Italy with this program and taught a kid in Barcelona. Both were amazing experiences. I remember viewing one position for someone needed to work three overnight shifts at a hostel in exchange for a bed and all meals. Look at how much time you’d have each week to teach your classes or explore and with your two biggest expenses covered! 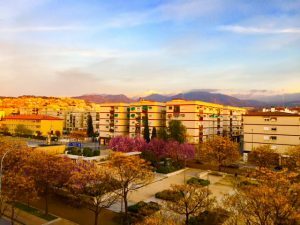 Did you do something different the last time you found an apartment abroad? Share it with us in the comments below! Have a question about these tips or the process? Just me know in the comments, and I’d be happy to help! I was inspired to share my experience with this by Jennifer at https://www.esleverywhere.com/. Check out her site for info about teaching English online! This entry was posted in How to Teach Online and tagged Airbnb, apartment, find an apartment, find housing, how to move abroad, live abroad, where to live abroad. Bookmark the permalink. ← Off2Class Review: Never Make English as a Second Language Lesson Plans Again! I’m not quite to the point with my online ventures to rely on them for a full-time income, but when I do I can’t wait to take full advantage of it by traveling. You give some awesome tricks and tips for someone looking to change locations! I like the idea behind the house swapping or house sitting, that could save you a ton of money like you said. As well you mention things like air b&b, these can make finding short-term places to stay super easy to find and an easy on the wallet. Awesome post, keep em coming. Hi there, very interesting indeed. What I would like to know though is what can I, as a Swiss, with second language English work as an online teacher from Thailand. Do you have any recommendations for me? Thanks for the help and have a nice day. While online language schools tend to have more strict requirements for applicants, there are some programs that allow teachers who demonstrate a certain level of proficiency to teach. Check out this post for some options: https://oetjobs.com/non-native/. You can also create a profile on italki.com or create your own site and teach any language you speak! Hello Jason! This was so much fun to read. It takes away all the cannot do it..and turns it into oh yes I can. Do you know of similar programs for the older generation? I am really wanting to explore opportunities and I think that house sitting might indeed be the way to go. Thanks for such a thorough and interesting article. I need to go pack my bag now! I’m glad you enjoyed it! House-swapping and housesitting are quite popular with older generations, especially the former, as they tend to actually have a house to swap 🙂 I feel it’s often the case that people in this age group tend to build trust with one another more easily, and understandably so: it’s your house you’re sharing, after all! I have met people of all ages in coworking spaces, hostels, and other less-likely locations, however, so you never know! If I do find a better program, I’ll be sure to link back to it here. Hey man, very useful tips. Using a realtor only results in higher costs and I prefer to explore the area myself when looking for a place. Love the third tip on first renting and then looking around. When in the area, you are sure to find much better places (via others) more easily. Certainly going to try this one the next time I’m moving!